Timepiece repairs can be expensive and often take a long time, which is why you would want to avoid damaging a watch. For most people it’s obvious that throwing your watch against a wall, running over it with a Bentley, or smashing it with a hammer are things to to avoid. However, not everything that can damage a watch is so obvious, so here I list five common things you may not be aware of that can damage a watch and how to prevent them. When you spend a lot of money on a fine timepiece, the last thing you want to do is to have to pay a small (or large) fortune repairing it simply because you did not take time to read the instruction manual. You should not make adjustments – such as setting the date or day of the week – when the time on the watch reads between the hours of 9:00 pm and 3:00 am. Each movement has its own guidelines so this may vary a little, but avoiding setting anything a few hours either side of midnight should keep you out of trouble. The reason is fairly simple: although a date, the weekday, etc. makes its changeover close to midnight, the gears that make that change happen to engage quite a bit earlier. And it takes extra time to disengage completely in the aftermath. Result: The most common result is misalignment of the date in the window and there could also possibly be broken components floating around in the movement. Prevention: A simple rule of thumb when making adjustments is to bring the hour hand to the lower half of the dial, maybe 5:00, 6:00, or 7:00, prior to adjusting the complication. This will ensure that you are out of the “Danger Zone” (queue the cheesy Kenny Loggins song from Top Gun). Refer to the instruction manual to know what the “safe” times of any specific watch are. A screw-down crown on a watch, common on diving and sports watches, helps to maintain the added depth rating by keeping the stem snugly secure in the sealing gasket. After winding or setting a watch with a screw-down crown, it is necessary to screw the crown back in correctly. This ensures proper water integrity. Result: If the crown is slightly out of alignment when you screw it back in, the threads of the tube and crown may cross and cause permanent damage. Prevention: Simply take your time screwing the crown back in! A crown should rotate at least 1.5 full turns, but only up to three full turns, while being screwed in. If the crown seems to stop very quickly (under one full turn), do not force it. In fact never force anything on a watch. Back down, unscrew fully, and attempt again. The winding stem is not sealed by screwing in (that’s the job of the rubber seal), a screw-down crown just minimizes the risk of the stem moving in the seal while under water. Keep in mind, you do not ever have to torque your crown down too tightly – just until it stops is fine. It is possible to screw it down so tightly that it can be all but impossible to unscrew. Each watch has its own personality, and until you become comfortable with any particular piece, don’t push it. Get to know your watch. And while this is rare, I did have a client once who came in with a badly water-damaged watch. When I asked how this happened, he told me that he was on vacation and he and his kids were timing how long they could stay under water. I guess the watch lost! Result: Most chronographs are water-resistant to at least some degree. The chronograph pushers hold water at bay with no problem in their normal positions, however when a pusher is pushed into the case it can compromise the seal and allow water to enter, causing major water damage. Because parts of a watch movement are small and metal they can quickly rust and dials and hands can discolor. 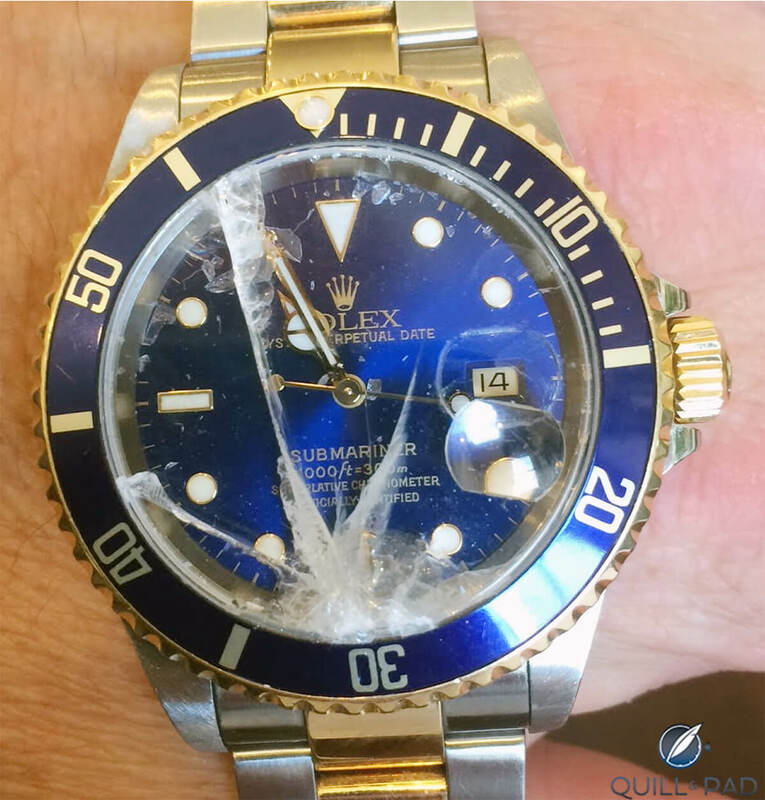 This can be a very pricey repair, while in some cases it can “total” the watch, leaving the repair cost higher than the residual value of the whole timepiece. Prevention: Do not use your chronograph while under water! In addition, some watches have screw-down chronograph pushers. If your watch has these, be sure that they are screwed in. Recessed pushers are not very common and many watch collectors are not even aware they exist. But they most definitely exist on many complicated and expensive timepieces such as perpetual calendars. Essentially, these ﬂush-to-the-case pushers control adjustments of complications such as the date, day, month, leap year, and moon phase, etc. On the Martin Braun Eos Boreas, for example, they also control the adjustment of the sunrise and sunset indications as well as the equation of time. Brands selling watches with recessed pushers generally deliver a stylus or push pin with them. Using the stylus, pressing the pusher all the way in and letting it come back all the way out will advance the watch by one day for example. Result: If the pusher is half-heartedly pushed in before it is let back out it can cause complications to get stuck in the middle of where they should be (between the 7th and 8th on a date, say). Sometimes this can be quickly corrected by advancing the watch a full 24 hours by rotating the hands, but in some cases it must go in for a costly repair. Prevention: Take your time. Push the recessed pusher all the way in and let it all of the way out. When I was a kid, I remember sticking a paperclip to a magnet, then taking that paperclip off the magnet and sticking it to the refrigerator. Like that paperclip, small metal parts in a watch movement may become magnetized. If you rest your watch on a stereo speaker with a large magnet inside of it or even an iPhone, the magnetic fields can transfer to the parts of a movement. Watches usually start gaining or losing many seconds or minutes a day when the balance is magnetized. A good way to test if your watch has been magnetized is to wave it slowly and closely under a compass. If the compass hand moves as a result, your watch is magnetized. If you’re really out of luck, though, you won’t even have to do that because the result will provide the answer. Result: When this happens, it can cause the escapement of the watch to act very erratically or in rare cases seize up. This causes an erratic rate and as a result large discrepancies in the time display. Prevention: Be mindful of where you put your watch. Clock radios, stereo speakers, iPads, and other electronic devices with magnets in them should be kept away from your watch wherever possible. Disclaimer: no timepieces were harmed in the making of this post. What’s the craziest way you have damaged a watch? Let us know in the comments below! Do you recommend a watch be taken off when using iPad or computer? Not at all. I wear my watch during almost any activity aside from yard work or when I’m wood working (a hobby of mine). The only recommendation is if your iPad or computer have any strong magnetic fields emitting from them. One point though… a while back I had a magnetic iPad cover where the magnet was quite strong. I would avoid resting my watch close to it for sure and I ended up getting a new cover because it was always a little too close for comfort for me. I had an iPhone case that had a fairly strong magnet to hold the case closed and it definitely magnetised my Nomos watch as it started gaining 30 secs a day. A $15 demagnetiser from Amazon fixed it. Kindle covers likewise, of course. p.s. If you don’t turn the crown backwards a little after winding many manual watches, the winding gears can end up slightly unmeshed – and this can have the same effect as a degree of magnetisation – speeding up the watch a bit! I heard a bout a guy who pimped his Explorer 2 216570. The damage was irreversible. Hilarious, Mark! But What Makes Me Tick said in the comments that the PVD actually is reversible…. i want to know if my omega planet ocean with si14 spring can resist th magnetic field of iphone or ipad ? it’s 9300 movement co-axial , but how many gauss can it resist ? Interesting that Omega has solved all of these problems on their modern watches. Forgot to mention watches that allow full functionality of chrono pushers to their full rated depth such as the Sinn U1000, Omega Seamaster Professional and Tag Heuer Aquagraph. After all isn’t is silly to build a diving chronograph you can’t use while diving? Isn’t it silly to make a chronograph divers watch. I mean, you are underwater for cripes sake. I’ve got a Rolex Submariner and the accuracy of the watch can get off by 5 mins. What I usually do is that I wind the watch 15-20 cycles and after that, the watch is accurate for a number of days. Will this damage the movement of the watch? About magnetising, I had a client who kept bringing his watch back to me. It was drastically gaining or loosing second no matter our interventions. He ended by telling his job : he was a DJ. Surrounded by magnetic field. I told him to go to quartz watches or some antimagnetic models! It happened to me in my Rolex Yachtmaster II albeit Rolex movements are robust mechanical wise. To set the regatta timer, you must follow sequences first rotate the bezel, press the button at 4 o’clock and pull the crown to adjust timer’s red arrow indicator. Before concluding sentence, I must say you can adjust the date at any time,any moment in any modern Rolex movement. What about vibration? For instance, the vibration of a parallel twin motorcycle? Notwithstanding what you wrote, several chronographs are designed to have the chronograph function work under water, without compromising water resistance. These include IWC Aquatimers and I believe some Omegas. My Speedmaster Mk II is missing a chronograph pusher at the moment. Should I avoid wearing it until it’s replaced? Or am I ok to just be careful! You should avoid wearing it until you have it serviced. That is a good way for dust and water to get in, and you may damage it further by continuing to wear it like that. On a side note: only authorized Omega repairers can replace anything on a modern Omega watch. You can probably find these through Omega. Good luck! Thanks Elizabeth. I feared so, but I find it difficult to take it off! It’s a vintage Mk II, and I have the missing pusher (I found it on the ground outside my house would you believe), just waiting until the watchmaker has time to fix it. 1) Is it advisable to let the movement wind down to almost nothing, before i wind it up to full power again? Or does it not matter? 2) Is it important to keep regularity in winding? Like every 4 days, to wind it up again? 3) Could I, under any circumstance, break the manual wind movement? 4) Is it advisable to periodically let it wind down to zero, before winding it up again to full power? 5) Is it “okay” to always have the spring wound up, by that i mean always leaving one day in the power reserve? I didn’t know that you shouldn’t make adjustments to the watch’s time or date if it’s between 9 at night and 3 in the morning. My husband asked me to reset his Seiko for daylight savings, and now it won’t work. I think I might have done it at 10:00 pm, so I should find a Seiko repair center and explain what I did wrong so they can fix it. Would it damage the watch If I kept it in a metal box? No, storage in a metal box won’t damage your watch. But if it’s mechanical (I’m not familiar with that brand), you should wind it periodically to keep the oils moving. Ohh, This post has really proven a great help to watch lover like me. I really need to take care of some of these unexpected ways that can cause damage to my watch. .I really appreciate your efforts of sharing your experience and information on such important issue.Thanks for such a great share. I totally agree when you said that there are people who submerge these things because out of dares or things they think of doing. That might be the reason why our clock is broken. It’s because my teenage son took it one time to school, and he might have done something that caused it to stop just like playing with it in the water.